Green stick gear was developed to reduce the high bycatch levels that are characteristic of longlines. Blackfin tuna catches peaked in the mid 1990’s at 4,488 tonnes. Since 2003, catches have fluctuated between 200 and 600 tonnes. 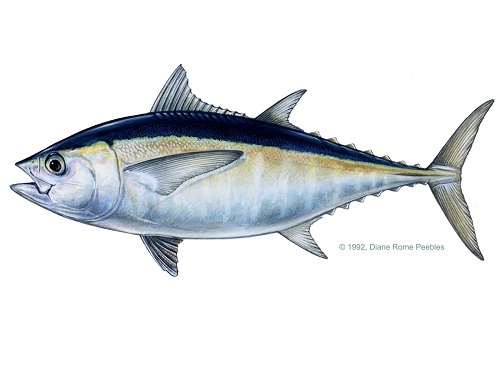 Blackfin tuna are found on the west coast of the Atlantic Ocean from Massachusetts south to Trinidad and Brazil. Due to a high age at maturity and other-life history characteristics, this species has a medium inherent vulnerability to fishing. Stock status of blackfin tuna is unknown as there is insufficient information to conduct an assessment of the population. Landings have been variable but it is not thought that the population is experiencing overfishing. The management body responsible for blackfin tuna in the Atlantic Ocean is the International Commission for the Conservation of Atlantic Tunas (ICCAT). No management measures are available for blackfin tuna either domestically or internationally. The last stock assessment for blackfin tuna was conducted in 2008 but uncertainty exists regarding the data used in this assessment. No scientific advice exists for blackfin tuna, and there are no set catch limits. Due to its high selectivity, greenstick gear cause minimal bycatch. Yellowfin tuna are primarily caught by greenstick. Other incidental catches include other tuna species, mahi mahi and other bony fish. Much like greenstick gear, due to their high selectively, troll/pole-and-line gears cause minimal bycatch– less than 1% of the catch is non-target species. Species of concern are not caught as bycatch, and any non-target species can be released live due to the nature of the fishing method. Greensticks do not make contact with the ocean floor and therefore cause little to no habitat damage. Trolls/poles-and-line also do not make contact with the ocean floor and therefore cause little to no habitat damage. In order to catch bigeye, smaller forage fish (e.g., sardines) are used as bait; the effect of the removal of these species on the ecosystem is unknown and few bait fisheries are managed. Blackfin tuna catches peaked in the mid 1990’s at 4,488 tonnes. Since 2003, catches have fluctuated between 200 and 600 tonnes. Blackfin tuna are found on the west coast of the Atlantic Ocean from Massachusetts south to Trinidad and Brazil. Due to a high age at maturity and other-life history characteristics, this species has a medium inherent vulnerability to fishing. Stock status of blackfin tuna is unknown as there is insufficient information to conduct an assessment of the population. Landings have been variable but it is not thought that the population is experiencing overfishing. The management body responsible for blackfin tuna in the Atlantic Ocean is the International Commission for the Conservation of Atlantic Tunas (ICCAT). No management measures are available for blackfin tuna either domestically or internationally. The last stock assessment for blackfin tuna was conducted in 2008 but uncertainty exists regarding the data used in this assessment. No scientific advice exists for blackfin tuna, and there are no set catch limits. Fish-aggregating devices (FADs) are large objects left in the ocean to attract a target tuna species (e.g., skipjack tuna). However, they also attract numerous other marine species (including other tunas, sharks, sea turtles, and birds). Many of the tuna they catch in association with their target catch are juveniles, and some of the non-target species caught are also of threatened or endangered status. Of special concern are catches of manta rays and silky sharks. Pelagic longlines are a nonspecific fishing method. Extensive bycatch of billfish, sharks, sea turtles and seabirds occurs. Non-target species caught include several threatened or endangered status species, such as silky sharks, Atlantic Bluefin tuna, leatherback turtles and loggerhead turtles. Some purse seines using FADs are anchored to the seafloor, but most do not contact the bottom and therefore cause minimal habitat damage. Nonetheless, the use of FADs could still impact the surrounding ecosystem. Juvenile tuna, specifically bigeye and yellowfin, are often associated with FADs and if fleets continue to catch these smaller fish, growth and recruitment overfishing of these stocks may occur. Pelagic longlines have minimal impacts on the habitat as they rarely make contact with the seafloor. Nonetheless, the fishery removes ecologically important species such as other tunas, billfish and sharks. This may have negative effects on the ecosystem. Blackfin tuna are considered an ‘exceptional species’ and the role of ecosystem based management of this fishery (and others) is a focus of ongoing research within ICCAT.